Travis Smith was born in Kauai, Hawaii, United States, on December, 1992, is an American male model. Travis was discovered in a shopping center Ala Moana in Hawaii, by model scout from Hawaiian agency. 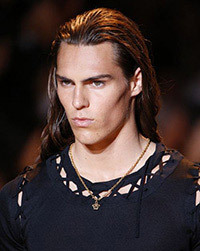 He made his catwalk debut for Versace in 2012. Smith's favorite hobbies are spear fishing, surfing, bodyboarding and swimming. GQ Italia, Harper's Bazaar Serbia, At Large, CLIENT, Esquire Serbia, Manifesto Cover, Reflex Homme Cover, GQ Spain, unFLOP Magazine Italy, Carbon Copy Cover, Arena Homme +, Out, Wonderland, D'Scene Cover, Interview Magazine, The Wild, Lab-A4, GQ Germany, ODDA, Made in Brazil, Document Journal, Manuscript, GQ Style Brasil, Details, L'Officiel Hommes Middle East, Hercules, V Man, Commons & Sense, Vogue Hommes. Brooksfield, Pull & Bear, Strellson, Versace, Versus. Walked runway for Jeffrey Fashion Cares, Scotch & Soda, Polo Ralph Lauren, Parke & Ronen, Versace, Ports 1961, H&M, Carlos Campos, Jack Spade, Dsquared2, Missoni, Philipp Plein, Jeremy Scott, Andrea Incontri, John Richmond, Calvin Klein. Represented by agencies MP Paris, Milan d'management group and Los Angeles DT Model Management. I never thought I’d have long hair at all. I’ve had short hair my whole life. I've been surfing my whole life. Doing surfing contest around the world! There are a ton of great moments in modeling but nothing beats the traveling. I've learned so much already at such a young age from traveling and I'm very grateful for that! Yoga is my secret workout! It keeps you balanced physically and mentally. I’m from Hawaii and there's really no fashion there. I went to a school where you didn’t even have to wear shoes and guys could turn up to class shirtless. Publicity is really hard. I mean, there is only so much you can do on social media and it’s not like we have a huge budget. Every other industry has become so digitized in the past few years. Fashion hasn’t really taken advantage of technology yet, but it will.